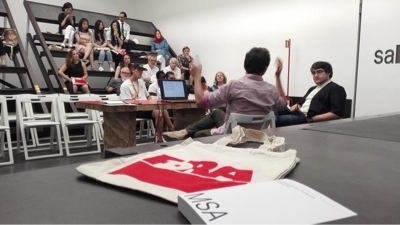 On June 29 2016 the MA A+U hosted their annual symposium entitled 'Frontiers of Responsive Architecture' as part of the Biennale Sessions at the Venice Architecture Biennale. This year's symposium held in the main pavilion at the Giardini di Biennale took the form of a conversation between Chilean architect Claudio Molina Camacho and James Taylor-Foster co-curator of the Nordic Pavilion at this year's Biennale based around a discussion of some of Molina Camacho's built and unbuilt projects. Molina Camacho had chosen the theme 'Human Relations, Social Interaction and Dialogue with the Landscape' to describe his work, which in turn responded to Biennale director Alejandro Aravena's theme of 'Reporting from the Front'. Taylor-Foster, whose own pavilion was based around the theme of 'In Therapy' acted as the interlocutor issues presented in the four projects which were presented. Molina Camacho began by relating his personal theme to fellow Chilean Aravena's broader purpose in his Biennale curation, exploring the topographic frontier presented by their capital city Santiago, surrounded by the encompassing presence of mountains. The first project he discussed, a space for a scout group attached to a school in the city could clearly be defined as a liminal building in accord with the Biennale theme. Completed in 2011 the timber clad building was designed to help educate the scouts how to survive in frontier situations. Constructed on a tree shaded and sloping site the deceptively simple buildings were described as a search for light with cuts in the envelope of the box like structures allowing for connections between the sheltered interior spaces and the wooded exterior, with the sound of running water on the site providing an ever present sensory link to the wider landscape. Responding to this project in his first intervention Taylor-Foster asked how the very assured project was developed in its contextual response in reaction to the previous accommodation but also in terms of the social landscape to which it is firmly rooted. In the second project which Molina Camacho discussed, the Ruka Vitral Mapuche Workshop, the building form, because of its severely limited budget evokes the universal typology of the primitive hut, and specifically because of its functional purpose for weaving that association used by Semper. This project for the teaching of indigenous weaving skills in a pastoral landscape presents ethnicity as a new frontier for architecture where traditional craft and building are reinterpreted for the present day. Comfortably situated in the terrain from which it derives its materiality, it is a simple building which distills its cultural values into architectural form. With a timber structure and reed thatch roof appropriated from the landscape comparisons were drawn by Taylor-Foster to Aravena's 'half a house' project, albeit here employing very different technology, and by Prue Chiles in her comment on the reciprocal relationship between th community and hand made construction. The third design project which Molina Camacho presented was a fly fishing centre in a riverine landscape which is undergoing decontamination, a 4.8 metre square timber tower which he described as like the trunk of a tree one can climb inside, an object of shared construction between the anglers and the local community. A spatially complex and geometrically precise structure the economy of means the project demonstrates suggests a potentially magical and elegant intervention in a recovering landscape. To close, Molina Camacho described the doctoral research he is about to commence at the Manchester School of Architecture on the rehabilitation of the surviving concrete market structure in Concepción, Chile an architectural and ethnographic studio which will allow him to further explore how interactions between people, construction and context create a responsive architecture. Following the symposium, it being the feast of St.Peter and St.Paul, many of the participants retired to the nearby Piazza San Pietro di Castello and joined the parish community in celebrating the height of the Venetian summer with food, drink, song and dance.